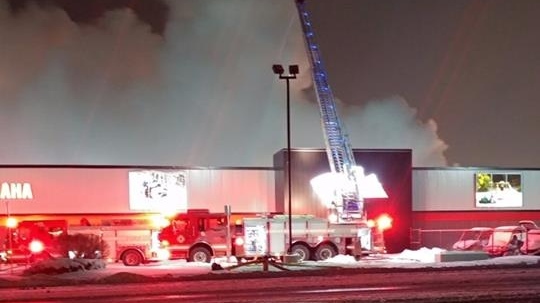 A fire destroyed a warehouse and caused between $2 million and $3 million in damage at Hully Gully Powersports and Marine in London. Fire inspectors remain on scene of the massive early morning blaze Thursday. New boats, ATVs and snow machines were all inside the warehouse. One firefighter was taken to hospital for smoke inhalation while battling the fire, but is expected to be OK.
A passerby on her way to work just before 5 a.m. noticed the fire on the property at Wharncliffe and Wonderland. 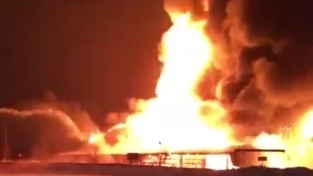 More than 20 firefighters arrived to a fully involved rear storage unit with flames shooting high into the night sky. Witnesses also report hearing a number of small explosions. Aerial ladders were deployed over the fire to contain the fire to the warehouse, and store owners say Hully Gully is open for business today despite the fire. 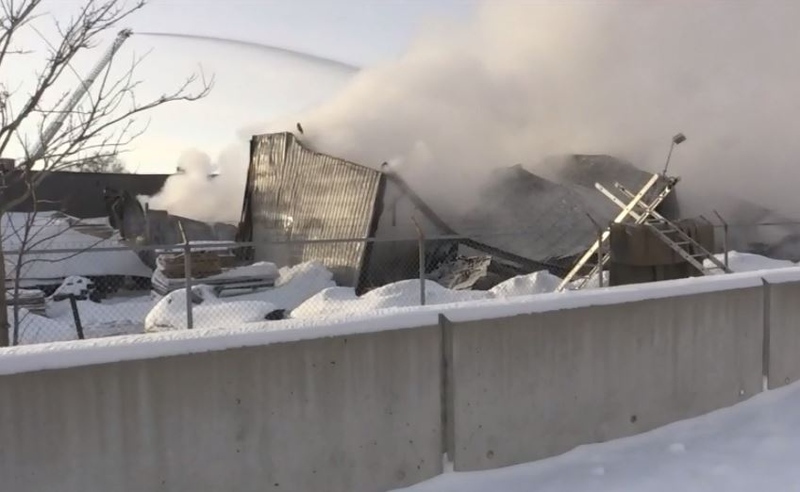 Owner Randy Collins said the loss was "tough to take" but expresses thanks for the efforts of London firefighters to help save the fourth generation business. The cold impacted the firefighters. "At first we had the heat coming off the building, which was able to keep us warm, but as the fire burned down and we were putting it out, we could really feel the cold," said one firefighter. A warehouse at Hully Gully containing boats, motorcycles and ATVs was destroyed by fire on Thursday, Dec. 28, 2017.